In June 2014, the Mississippi Religious Freedom Act passed into law, giving businesses—including restaurants—the legal right to turn patrons away citing religious beliefs. How are we still fighting such injustice? In the 1960s, lunch counter protests sparked integration; today, chefs collaborate to support the legalization of gay marriage. Good food brings people together; it does not shut them out. So, in an age where chefs are gaining celebrity, they’re presented with a unique platform to voice philosophies that reach far beyond food, and advocate for equal rights. 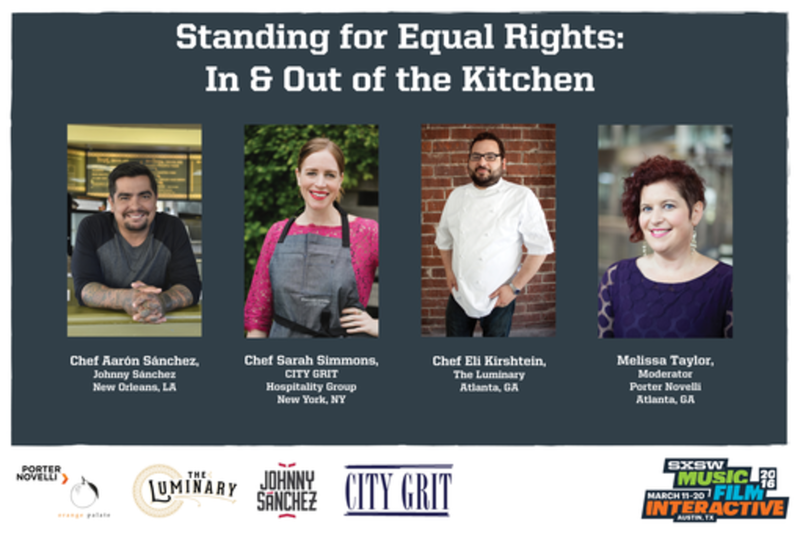 Join three chefs who’ve used meals to facilitate peaceful, respectful dialogue about basic civil and human rights nationwide. Aarón Sánchez is Chef/Partner of Johnny Sánchez, with locations in Baltimore and New Orleans. He is the co-star of Food Network’s hit series, Chopped, and the host of Cooking Channel's Emmy-nominated Taco Trip. He is also the host of two Spanish-language TV series on FOX Life; 3 Minutos con Aarón and MOTOCHEFS. Aarón’s passion, commitment and skills have placed him among the world's leading contemporary Latin chefs. Atlanta native and “Top Chef: Las Vegas” contestant Eli Kirshtein is chef/partner of The Luminary at Krog Street Market. Equal parts avid sports fan and accomplished chef, Kirshtein is a proud Atlantan and food anthropologist. As a chef, Kirshtein has been featured in The New York Times, The Atlanta Journal Constitution, Food & Wine Magazine and even a special-edition issue of Marvel Comics’ Spider-Man series. He has served on the culinary counsel for the Atlanta Food & Wine Festival, is a member of the Southern Foodways Alliance and The Culinary Council of The Piedmont Park Conservancy. Kirshtein is also a proud supporter of the Atlanta Jewish Federation and Birthright Israel‎. Outside the kitchen, Kirshtein is a part-time sports writer and full-time SEC enthusiast. In August 2014, Kirshtein brought his distinct style, perspective and technique to Atlanta’s highly anticipated Krog Street Market with the opening of his first restaurant, The Luminary. Voted the “So Hot Right Now” restaurant in Eater Atlanta’s annual awards, the French-American brasserie with regional influences features a classically inspired menu, large raw bar, craft beer and cocktail program, and 400-square-foot patio space. In October of 2015, Simmons returned to her Carolina roots to open Rise Gourmet Goods & Bakeshop, a “southern boulangerie” serving artisanal breads, pastries, sweets, and gourmet goods in Columbia’s Five Points Neighborhood.